You get two-for-one in this hilarious and hard-hitting new collection by much-admired performance poet Scott Kendrick. As well as new poetry, this volume reprints satires originally published in the underground satirical newspaper The Babylon Express. Poems in this collection range from the deadly serious to the profoundly silly. From searing examinations of United States’ foreign policy to humorous jabs at our own materialistic culture; from love to student loans to cricket. 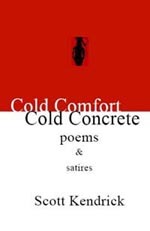 Several poems deal with the war in Iraq, including the heartbreaking ‘Obscenities’, which juxtaposes a young couple’s first sexual experience in a car with the killing of Iraqi women and children at a US army checkpoint. The poems bowl along at a lively pace, usually with Kendrick’s characteristically energetic rhythm and rhymes adding to the humour, or the horror. Kendrick combines a vernacular voice and contemporary concerns with his sharp intelligence and wit. As well as politics, the satires deal with contemporary issues such as the Brian-drain (‘412 Brians leave NZ in six-month period’), societal breakdown following Wellington’s caffeine shortage and who is starring in the latest Hollywood poems. Scott Kendrick’s love of language and rhythm, and his keen wit and intelligence has led him to twice win the Wellington Poetry Slam. In 2001 he started the underground political satire newspaper The Babylon Express, which has developed it’s own small cult following. His first collection Rhyme Before Reason was published in 2001 by HeadworX. He's moved back to his hometown of Otaki, after living in Wellington for many years.